Gedanken Me This: Why not open up your classroom content? NOW), and I have enough experience to know that the slides are not my presentation–I’m the presentation; the slides are just a tool that make it easier for me to present to a larger number of people. One of the main reasons I began using presentation software (which can include Microsoft’s PowerPoint, Apple’s Keynote, OpenOffice’s Impress, Google’s Docs, etc.) was to make my “lecture notes,” graphics, and material covered in class available to students who had been absent, or for those who just wanted copies to review with. I made PDF printouts of the slides available for download on the course website, but was reluctant to share the actual slides themselves. Because… well, those are MY slides. I’ve been working on MY slides for YEARS now, refining them a little almost every time I use them. I feel suprisingly attached to those slides, and protective, and I’m not alone in this. At least two of my colleagues–one where I currently teach, and one at a former school–feel exactly the same way. 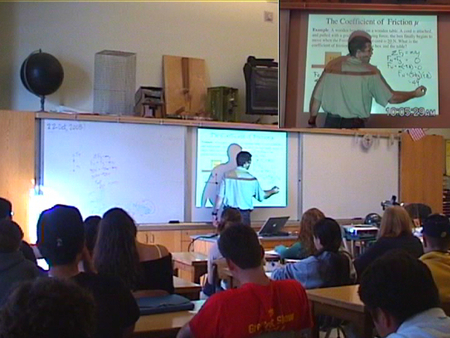 The colleague in Northern California is about as hybrid as it gets: this guy–my best friend Aaron, and partner in edtech crime–actually records video of his lectures every day, and posts it on the Internet for his students to see. But you can’t get him to share his slides with you to save your life. It’s funny. So here’s your Gedanken for the day. Why NOT share your slides? Seriously. Why not? Why not share your slides, and your handouts, and just about everything else that you use in your class? What do you think is going to happen if you do? In software development, this idea of opening up your source code for the world to see (and for others to potentially collaborate on) is called “open sourcing,” and we teachers have been doing this for years. “Steal from the best” is the advice my mentor teacher gave to me, inviting me to watch and learn from others, and freely incorporate whatever ideas I thought would assist my own development as an educator. We do this informally (“Hey, how are YOU teaching “Macbeth” this year?”), formally (“We need to sit down to plan this next unit together…”), and institutionally (“Richard, how’d you like to work with a student teacher this semester?”). And frankly, all this sharing? I love that about our profession. So I don’t know why I’m so protective of my course materials. In discussing this, my friends and I came up with lots of great pretend-excuses. I’m not convinced that any of these points stands up to much scrutiny, though. In the end, making slides available to students and colleagues enhances your ability to communicate with them, and does absolutely no harm to you or your teaching that I can think of. Ask yourself this question: if you were to die tomorrow, would you prefer that your slides pass into the afterlife with you, or would you like them to be available for the potential benefit of others? I’m not entirely comfortable with the idea yet myself, but… I’m opening up my class. Not EVERYTHING, of course. I can’t post online materials that I AM allowed to use in class under Fair Use doctrines of U.S. copyright law. I’m not going to publicly post students’ grades, or other materials to which I don’t think students should have free access (next week’s test comes to mind here). And my PowerPoint slides? Well… okay. I’m in.